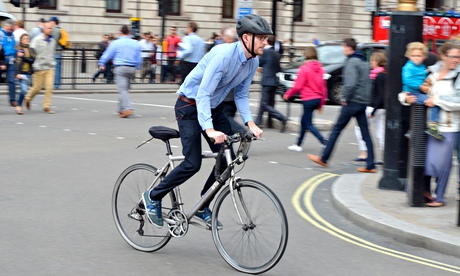 The team in Glasgow said cycling took no willpower once it became part of the work routine - unlike going to the gym. The five-year study compared people who had an "active" commute with those who were mostly stationary. "This is really clear evidence that people who commute in an active way, particularly by cycling, were at lower risk," Dr Jason Gill, from the University of Glasgow, told the BBC News website. "You need to get to work every day so if you built cycling into the day it essentially takes willpower out of the equation. "What we really need to do is change our infrastructure to make it easier to cycle - we need bike lanes, to make it easier to put bikes on trains, showers at work." Clare Hyde from Cancer Research UK said: "This study helps to highlight the potential benefits of building activity into your everyday life. "You don't need to join a gym or run the marathon. "Anything that gets you a bit hot and out of breath - whether it's cycling all or part way to work or doing some housework - can help make a difference."